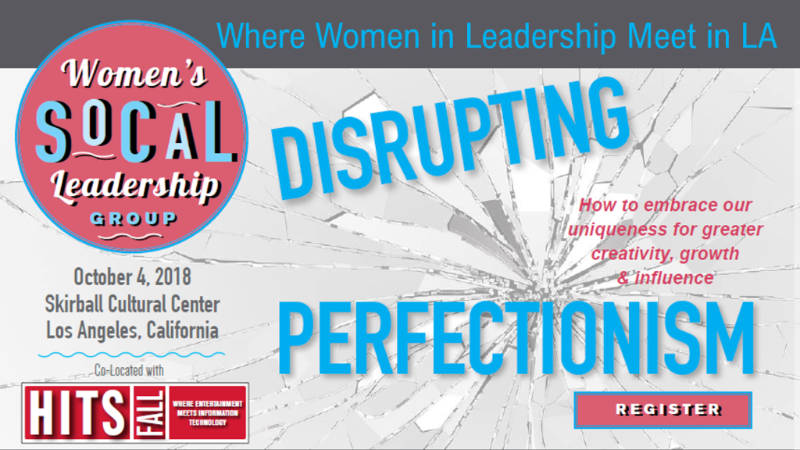 The concept of “Disrupting Perfectionism” will be taken up by a consortium of Hollywood’s leading women’s groups at the Oct. 4 SoCal Women’s Leadership Group annual meeting at the Skirball Cultural Center in Los Angeles. The fall event will feature a keynote address and workshop that promises to pry open the perfectionism prison and deliver practical, pragmatic practices that will unleash higher levels of performance, satisfaction, vitality and confidence. One key question to be addressed: How can we bring awareness to the perfectionistic blind spots that exist in our daily work, in managing our careers, in selecting the projects we pursue and those we don’t, and the opportunities we pass up? Registration will be held 3:30-4 p.m. and the doors will open for seating at 4 p.m.
• Nell Merlino, creator of Take Our Daughters to Work Day and founder and president of Count Me In for Women’s Economic Independence, will give the keynote presentation, “Courage vs Perfection,” from 4:30-5 p.m. She knows a thing or two about scaling, disrupting the status quo and mobilizing millions (of people and dollars). She launched the Take our Daughters to Work movement, which inspired 25 million people across the U.S. to bring their girls to work in 1993, mustering up this movement with only two fax machines. And that was before the internet, before influencers and going viral. Since then, she created an initiative for female entrepreneurs called “Make Mine a Million $ Business” (think “Shark Tank” for women). Merlino will share her principles and practices to stop your hesitation and get to action. • The workshop “(Im)Perfection Lab: How to Embrace our Uniqueness for Greater Creativity, Growth & Influence,” from 5-6 p.m., will feature a presentation by Jasmine Ferres, coach for Collective Gain and founder of Tosha Coaching + Consulting. Attendees will learn how to assess their current mindsets, identify what’s holding them back and how they can disrupt the perfectionist way of thinking that limits our own opportunity. Professional coaches from Collective Gain will be on hand in the audience to support everyone through the process and attendees will come away with a growth-centered perspective and actionable next steps to unlocking their highest potential. • There will also be a networking reception. Once again, the SoCal Women’s Leadership Group annual meeting will be co-located with the Hollywood Innovation & Technology Summit (HITS) fall event. The SoCal Women’s Leadership Group will join HITS: Fall attendees for a networking reception from 6-7 p.m.
• SoCal Women’s Leadership Group annual meeting attendees are also urged to come early for a special, complimentary HITS: Fall keynote at 2 p.m. Molly Bloom, author of the memoir “Molly’s Game” — in turn made into a film of the same name by Aaron Sorkin — will give an exclusive presentation, “How to Manage Risk and Create an Unforgettable User Experience.” In it, she will offer studio tech leaders insight into how they can manage business risk, make data-informed decisions, and better capture the imagination of the consumer. For those not familiar with her story, Bloom built and managed a famed (and notorious) private poker game worth hundreds of millions of dollars, catering to actors, athletes and others. Produced by Women in Technology Hollywood (WiTH) in cooperation with the Women in Cable Telecommunications (WICT), the afternoon program is supported by these leading women’s entertainment coalitions: Fox’s Women in [email protected], Lionsgate Women’s Empowerment Group (WEG), NBC Universal’s SoCal Women’s Network (WNN), Netflix’s Women in Tech, SPE’s Women in Technology (WiT), Women of Fox Sports, Women of Warner (WOW) and Women of Action Vision and Empowerment (WAVE). For more information about the SoCal Women’s Leadership Group annual meeting, click here.